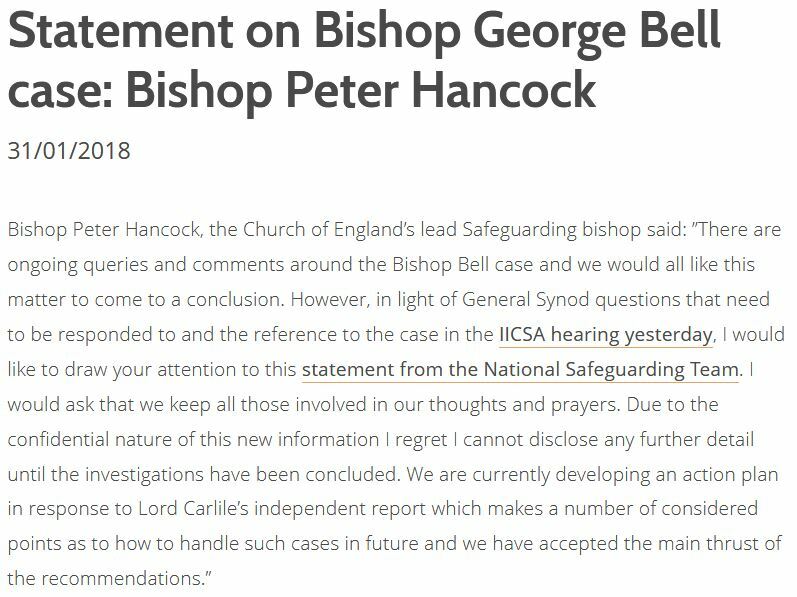 The George Bell Group was established in 2015 to defend the integrity of the much maligned (60-year-dead) Church of England Bishop, who had been accused of abusing a child between 1929-1958. The Group’s independent members represent a concentration of experience in public life, in the fields of law, policing, politics, journalism, academic research and church affairs. A further independent group of Bell supporters are due to gather at Church House today to debate the Church of England’s inept handling of the allegation, as assessed by Lord Carlile, and are expected to be highly critical of the Archbishop of Canterbury Justin Welby, who says that a “significant cloud” now broods over George Bell, though this (he insists) “does not diminish the importance of his great achievements and he is one of the great Anglican heroes of the 20th Century”. Concurrent with this planned debate have been discussions between members of the General Synod of the best way of proceeding in light of Lord Carlile’s serious criticisms, with the certainty of posing a few pointed questions as they gather next month, and the possibility of a highly critical Private Member’s Motion. There is nothing suspicious about the timing of these announcements at all. No, absolutely nothing at all. 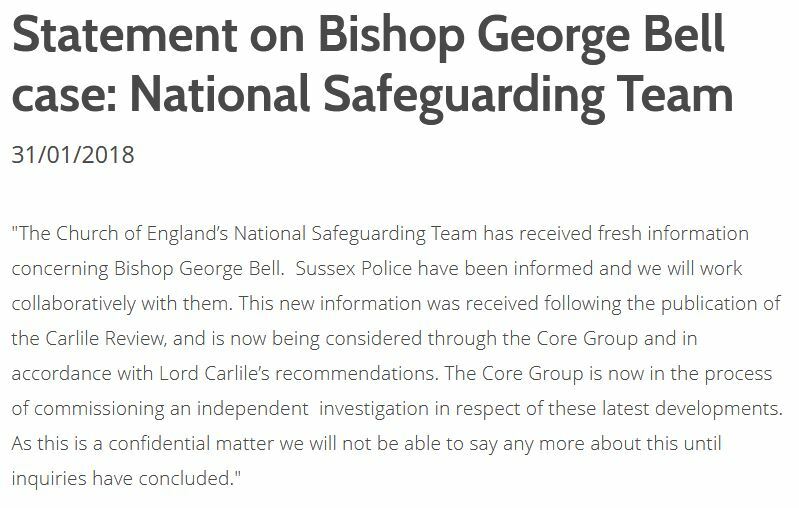 The matter has been referred to Sussex Police – despite Bishop George Bell having been dead for 60 years – and an official investigation is now ongoing. Nothing more can be said. It’s all conveniently confidential and quasi-sub judice. There is nothing suspicious about that convenience. This “fresh information” about this further allegation cannot be viewed or scrutinised. And certainly not by anyone in the George Bell Group. No, not by anyone at all. The “significant cloud” which was brooding over the good name of George Bell has just been sprinkled with a hefty dose of silver iodide crystals courtesy of Lambeth Palace, while Church House lawyers did a rain dance. The poor deceased Bishop now has a ruddy great cumulonimbus towering over his spirit, with ecclesial warnings of lightning, wind and hail. But none of this diminishes the importance of his great achievements. 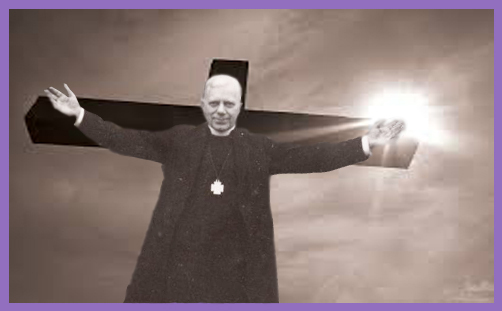 He is still one of the great Anglican heroes of the 20th Century.